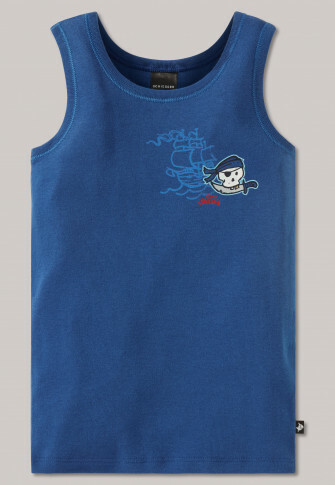 Daywear for little sailors: This blue boys undershirt from the popular SCHIESSER line "Capt'n Sharky" is good for any adventure! Elastic single jersey makes it wonderfully comfortable and it looks great as well with the dangerous pirate skull and his glittering gold tooth. The blue sailing ship in the background and a red serial lettering add further exciting details and make this shirt a favorite for all Sharky fans!